With my increasing, though long term interest in technology related to sport I was very interested to see this article by the Wellcome Trust about brain scans revealing the clues to black belt punching power. There is of course a lot to be discovered about how we work as humans. Self belief we already know is very powerful and can drive people to achieve things other may consider impossible. That self belief in Martial arts could be down to fine tuning and practice of techniques. This article points to a change in brain structure as certain skills are perfected. To my non neuroscience trained eye that makes a lot of sense. As is said in the video you can know thousands of techniques, be big and strong and be defeated in an instant by your mind. My Choi Kwang Do journey is still in its very early stages but I have already felt surprise at what can be achieved, both watching the predlets and also myself. Something that is very important is experiencing flow, being in the moment and operating without having to do any conscious mental processing. For some people that is one of the hardest parts of the journey, to let go. I am by no means an expert in flow, but I have experienced it a lot, coding, presenting and particularly in gaming. Tackling a tricky section of a game where you get more and more wound up, the more tense you are the harder it is to perform. Sometimes brute force aggression gets you through as that bring adrenalin but inevitably a more calm, flow based approach will bring more success. It is something I am trying to teach the predlets through gaming as the results and the pay off are very obvious. Being able to induce flow is the best mental state for interesting ideas and inventions to surface. Many people get flashes of inspiration when they are doing something other than trying to get a flash of inspiration. It may be that out there in the workplace and in schools and colleges that the solution to helping people both stay fit and healthy and have a keen brain that comes up with good ideas and is not afraid to go with them may be enhanced by many of the martial arts. In particular those that are arts not sports like Choi Kwang Do (other martial arts are available). Olympic legacy, what next? Daley Thomson’s Decathalon 2? So the first part of the Olympic experience is complete. Next up the paralympics. we were lucky enough to get some tickets in the fiasco that was the Visa only powered ticketing ballot/raffle and we went and saw the Gymnasts do their thing at the North Greenwich Arena (a.k.a. O2, a.k.a Millenium Dome). It was really interesting to see the event as a whole. We all hope of course that more people will get into sporting activity and generally keep the sociable atmosphere that we have all enjoyed at the friendly games as they have come to be known. I have no doubt many kids will at least try and take up sport, and the government will apply the right funding and not let all schools sell off all their fields. The predlets have been amazed by it all, Predlet 1.0 wants to continue her gymnastics, but it also now joining predlet 2.0 and I in Choi Kwang Do. So I suspect that will be mirrored across the country providing the clubs can cope with the demand. It has also led ( in hour house) to some competitive gaming with the “official 2012 game” on the Xbox. Whilst it does have some flaws it is quite a collection of button bashing angle selecting frustration inducing game play, but it does make everyone have to accept whether they are faster, or better at that instant in time and it does reward practice. We have of course been there before with sports games. The original arcade Track and Field was a masterpiece of gaming cabinet action. This then managed to be sort of cloned 😉 and placed in our homes with the then new machines of the C64 and Spectrum with Daley Thompson’s Decathalon Using our GB hero as the lead character and something that is talked about much more fondly than the arcade game. So will there be a new rash of TeamGB star games? Will that be part of the legacy? Being able to emulate one of the stars of the games will continue to inspire kids, some of whom will take up the sport because they also get to play it and understand a bit about it and get a thirst for winning not just levelling up for ever as many games seem to rely on now. A more important legacy, and this is wishful thinking, is that the next games understands and embraces the way we choose to communicate online, not trying to stifle it or blame it for branding transgressions. (I have to say for all the official branding fuss the actual event we went to seemed almost completely free of in your face advertising). I also hope the next Olympics will take the sort of wonderful digital coverage the BBC provided, and still provides with archives and extends it to give us things we can interact with, 3d spatial data we can learn from and maybe even use in the games experiences I already mentioned. 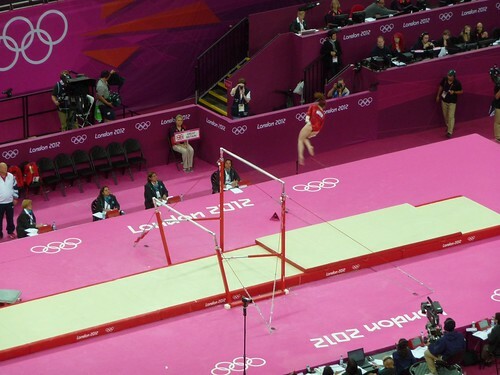 I noticed at the gynastics they had a matrix style camera on the vaulting horse. It was only used a few times in replays but it generated an image from the front and panned 90 degrees to the side filling in the gaps and looked brilliant. Imagine being able to choose to view that sort of replay in any event from any angle just as we can right now with multiplayer online game replays. Yes I am still talking about the sort of thing we built in ’06 for Wimbledon in Second Life, years ahead of its time it would appear! but lets hope Rio brings a new look at the technology. Even if it is the simplest of e-commerce ticketing applications being done correctly ! So, I loved the Olympics, the team delivering the actual event, and the athletes efforts were brilliant. Well done to them. It was also astoundingly good for TeamGB 🙂 well done all. Mars – Curiosity – inspiring a generation too? This morning amidst the amazing sporting achievement of the Olympics we had the great news that the Curiosity Martian rover had arrived and landed safely on the planet Mars. It may not seem quite real, but it has taken 8 months to get to 350+ million miles and then descend and land safely in a complex “7 minutes of terror” as the scientist called it. The project cost a mere $2.5 billion according to reports. That is a mere drop in the ocean when you consider the money spent on things like banking bailouts and alike. NASA has always been good at sharing what is going on online, but this time this project is tweeting to the world too. So to follow @MarsCuriosity is a must. The web exists to share information, that was the original intent. So when lots of others are still locking away their information NASA is giving theirs to the world. It takes 14 minutes for a signal to get back from Mars, and to get from earth back to the Rover. It is how ever not doing it on its own. Two other orbiting spacecraft are acting as relays in orbit for it, Odyssey and MRO. So that’s 3 objects 350 million miles away on another planet interacting with mission control back here on Earth ! It is still just amazing isn’t it!!!!! The official website has a stack of information, e.g. the batteries on this laser firing, sample collecting and analysing, self driving collision avoiding marvel will last over 600 days! Take that iPhone/3ds/laptop ! London 2012 is set to inspire a generation of athletes and achievers, I hope that Curiosity, now and during the next 2 years of analysis inspires a generation of scientists and explorers. That has to be worth a few billion $? Issue 3 of the full Flush the Fashion magazine has just gone live, complete with my multiple page spread on 3D printing 🙂 It starts on page 107 (but obviously read the rest of the excellent mag too. It is awesome to see professional the job done on the text I wrote and some of the pictures I provided, but added with a whole lot more. Makie’s are in there, Second Life Reebok trainers, Minecraft printing and the TVRRUG reprap as seen on The Cool Stuff Collective and a Raspberry Pi case. You can view it online with the viewer above or download it here as a PDF and there is a regular weblink too. So virtual worlds last issue, 3d printing this issue whats next? I have a cunning plan.